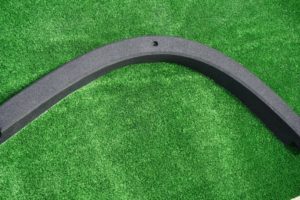 Gecko’s unique recycled tyre Rubber Safety Logs are a durable and an easy to install item that look great around the perimeter of any playground. They provide an edge with fantastic safety features to either define the playground / garden edge, or to confine other soft-fall materials like bark chips or sand from spilling out. Available with or without formed recessing, these logs are extremely durable and do not break down or splinter like treated pine logs. 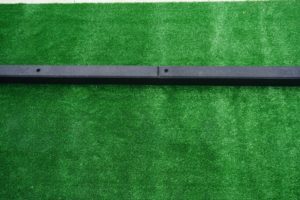 Rubber Safety Logs are perfect for retaining mulch, sand or stones and our recessed logs are suitable for use when installing synthetic grass, shock pads or pavers. Applications include garden edging, playground edging, plinth and court edging. Quick and easy to install Gecko’s Flexible Rubber Safety Logs eliminate sharp corners associated with other forms of garden edging making mowing a breeze and maximizing safety. Their unique Rubber composition allows for ‘flex’ in the log structure allowing for some movement if required during the installation process. Logs can then be fixed in place to eliminate further movement.